Family Father: Joseph Matthew Olszewski was born on November 14, 1918, in Plains, Luzerne Co, PA. He had one son with Lois Gertrude Osburn on September 9, 1949. He died on January 9, 1990, in Chico, Butte Co, CA, at 71, and was buried in Chico. Mother: Lois Gertrude Osburn was born on October 26, 1909, in Philip, Stanley Co, SD. She died on July 13, 1995, in Chico, Butte Co, CA, at 85, and was buried in Chico. 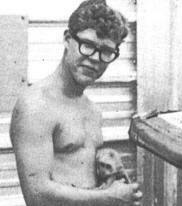 Joe Olszewski, seen above with a friend he met near his river boat base at Cu Chi. grew up in Chico playing music. He started with the coronet in fifth-grade and continued playing until he graduated from Pleasant Valley High School in 1967. Olszewski also enjoyed the outdoors of Northern California and was an avid hunter and fisherman as well as a Boy Scout. After high school, he briefly attended Yuba College, and in April 1968 enlisted in the Navy. After being trained as an electrician’s mate. Olszewski in March 1969 was sent to a river boat repair unit at Ben Luc, Vietnam. His father said he had two boats shot out from under him. On January 27, 1970. the young sailor was repairing the bow of a shot up boat. A crewman in the stern shouted for him and when he heard no response, went looking for him. The crewman found Olszewski unconscious and bleeding through the nose. The 20-year-old sailor had suffered an aneurysm. He died shortly thereafter, just a month short of coming home.